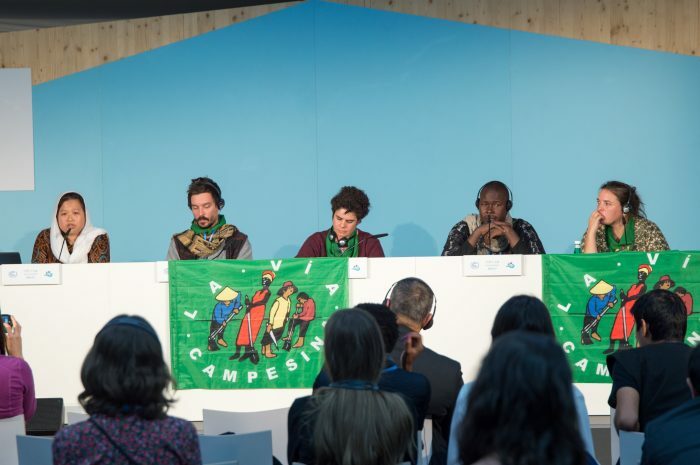 In the first day of the COP23 a group of development, church-based organisations (Caritas France, CIDSE and Bread for the World, Bread for all, both members of ACT Alliance) joined forces with the global peasant movement “La Via Campesina” for two side-events on the topic of agroecology. We decided to organize these events because we strongly believe that the global food and agriculture system needs to change fundamentally if we want to combat climate change, and at the same time adapt to it. We believe that the industrial food system is a dead-end and that we need to have a deep transformation of the way we produce, process, trade and transport food. Our side-events showed that peasant agroecology offers a promising pathway for the future to achieve this. Peasant agro-ecology is not a one-fits-all solution but refers to locally adapted, knowledge-intense, sophisticated and innovative ways of autonomous peasant farmers to grow food, and bring the food to local consumers. The panellists of our side-events really contrasted the “usual crowd”, because we invited peasant farmers and a representative of peasant fishermen and fisherwomen from all continents. They all gave their testimonies of agroecology from their different regions and daily realities. It was important for us to give the voice to those who are the primary victims of climate change, and who at the same time provide the solution to reduce greenhouse gases related to the global food system as well as provide healthy soils that can act as a carbon storage. A lot of issues being discussed at COP23 indirectly address land and agriculture. We organized these side-events to emphasize how important it is to bring the global food system into the centre of attention and debate. At the same time, there is a big fear that big multinational companies that profit from the predominant agroindustrial systems might dominate such debates with their false business solutions. We, therefore, need strong advocates and young leaders, such as our panellists, who oppose this, and who tell their stories about the real solutions on the ground.